“It is with a heavy heart that I announce the passing of Grace W. Lichtenstein, a political force in Rowayton for over half a century. Flags in Rowayton are flying at half mast in her honor,” Board of Education Chairman Mike Barbis, a Sixth Taxing District Commissioner, wrote on Next Door Rowayton on Friday. “An amazing force of kindness, perseverance and graciousness died today. Friends and foes alike should take a moment and remember her. A beacon of civility in the name of progress in an ever changing world,” Piet Marks wrote to NancyOnNorwalk on Thursday. “Stone, who was born in Norwalk, was arrested Friday and charged with lying to Congress, obstructing an official proceeding and witness tampering for his role during the 2016 presidential campaign when he allegedly tried to obtain stolen Wikileaks emails damaging to Hillary Clinton,” the Hartford Courant reported Monday, in a story about a Saturday Night Live skit. “FBI agents arrested former Trump adviser Roger J. Stone Jr. before dawn Friday at his home in Fort Lauderdale, Fla., after an indictment was unsealed in the Trump-Russia probe led by Special Counsel Robert Mueller,” the Boston Globe reported Friday. Wikipedia quotes an Hour obituary to explain that Stone was born to Gloria (Corbo) Stone and Roger J. Stone. Wait. Phase out the estate and gift taxes? And pay for it with…what, the proposed grocery and medication taxes? Is the “expungement of criminal records” for the Malloy clan? In theory, it is a good idea but a criminal record is just that…a bit of history that is sometimes important. Bills, bills, bills, ad infinitim. But none seriously addressed the State’s persistant billion dollar budget deficits and decade long faltering economy. So we know our future. More of the same. Continued Exodus of jobs, firms and residents. Our part time Legislature doth overwhelm itself. Grace Lichtenstein is an inspiration and a dynamic role model. I had never known about her, but wish I could have had the privilege of meeting her after reading this article. She sounds like she was a force to be reckoned with, in the best possible sense of the word. Thank you for enlightening us as to her life in public service and her accomplishments in shaping Norwalk. Prayers for her family and loved ones. 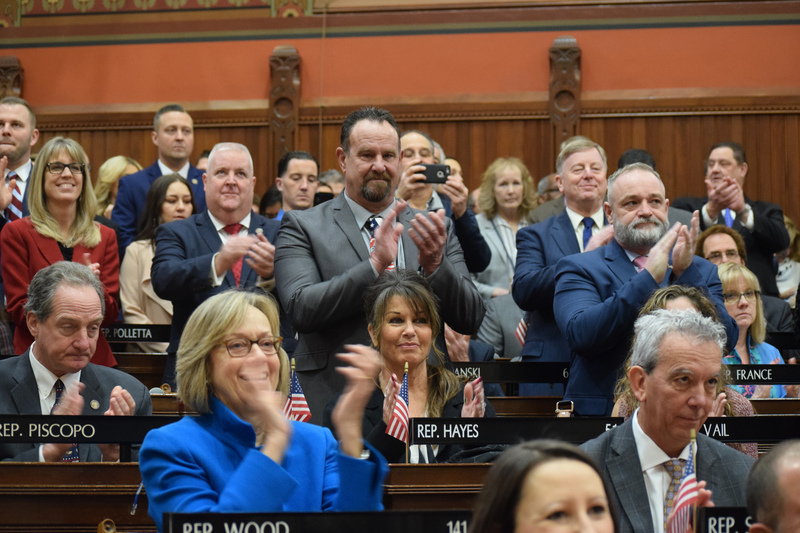 I have serious concerns about the combined impact of these proposals on growing Connecticut’s economy, creating jobs, and providing an opportunity for people to thrive in our state. There will be opportunities to testify on these proposals to make your voice heard. Keep an eye out for emails from me with information about public hearings and opportunities to share your opinions. Grace Lichtenstein will be missed and was a force to be sure! Years ago, she and I used to speak about how difficult it was to advocate for good governance due to Norwalk’s unique political culture, which still reigns supreme today. She was a member of the Norwalk LWV and the Land Trust, and offered advice when pesky politics got in the way of doing good. She will be missed! Point of historic clarification: The effort to stop the Gault Tank Farm Zoning Permit was a beautiful thing that involved many people, black, white, rich poor, middle class, South Norwalk, Rowayton, religious officials and environmentalists. Some of us went to the Committee meetings, held South Norwalk homeowner teach-ins, held prayer vigils, raised funds. It was not easy and it took many months of effort. I know this because I played a lead role and organized the first phase. The second phase, where Grace may have played more of a lead role, had to do with supporting approval of the SoNo Field House Zoning permit. The Grace Lichtenstein that I knew would want to make sure historic accounts are accurate. Roger Stone born in Norwalk? I’m surprised he moved away to get involved in national politics. Nobody must have told him that being born in Norwalk is quite the feather in one’s political cap here. Thank you for the historic clarification of your role in the organization of the first phase, Diane. And thank you for fighting for Norwalk. Your efforts are much appreciated by many of us out here who listen and follow. You sound like you are cut from the same cloth as Grace Lichtenstein. We need more from that cloth in Norwalk, now more than ever. Let’s all keep on keepin’ on in Grace’s spirit! Really? No… Really? Hey, Mr. Simms… How about an act concerning Norwalk residents’ proof of citizenship? Surely, you cannot pass one without passing the other… Double standard? Correction: CT, not Norwalk, residents’ proof of citizenship. Many of these bills are just tone deaf and nonsensical! Surely we have better issues to advocate for?